1. Read the instructions completely before starting and verify you have the materials and tools listed. 2. Select a good location for placing your flagpole, check and make sure there are no power lines above or below ground. 3. Dig a hole 12" in diameter and 26” deep, using the size of a typical post hole digger, in firm or heavy soil. A large hole may be necessary in loose or sandy soil. 4. 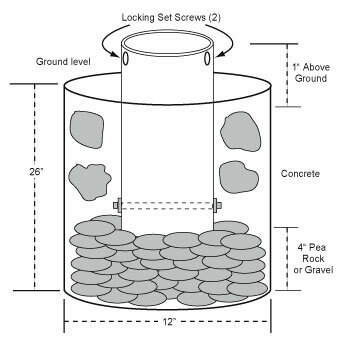 Place the pea rock or gravel in the bottom of the hole and level to a depth of approximately 4". The pea rock or gravel will help with drainage. 5. Install the 2 1/4” stop bolt in the ground sleeve with the nut on the other side of the bolt. Tighten nut so that the bolt is not damping down too tight on the ground sleeve. 6. Place ground sleeve in the center of the hole and lay the level on the ground across the hole next to the ground sleeve. You should have 1" of the ground sleeve above ground level. If not remove ground sleeve and add or remove pea rock or gravel as needed to obtain the 1" measurement above the ground level. (We have heard of folks that they have the top of the ground sleeve level with the ground so they can remove the pole and go over it with their lawn mower). 7. Wedge 4-5 medium size rocks between the ground sleeve and the side of the walls. This will further secure the ground sleeve after the cement has dried into the hole. 8. Pour concrete into mixing container and then mix as directed. 9. Have your assistant hold the flagpole in the center of the hole and use the level to check the flagpole's alignment. Now pour the concrete into the hole and make sure that it will slide through the rocks and all the way to the bottom of the hole. Top of the cement will be approximately 2” bellow ground level. Check two locations on the pole 90 degrees apart with the level to insure the pole is straight up and down. Allow concrete to set before removing pole from the ground sleeve. 10. Let concrete harden according to the manufacture's requirements. We recommend placing a warning flag or some object by the ground sleeve. This will protect the ground sleeve from being disturbed as well as eliminate the chances of personal injury while the cement hardens. 11. Allow at least 24 hours for the cement to harden before you can raise the flagpole at its highest position. Improper installation will void your warranty! Note: An alternative way to secure the ground sleeve in sandy soil is to cement the sleeve in a five gallon bucket and burry the bucket into a larger hole in the ground as above. After the pole is in the ground sleeve, use the hex-key to lock the two set screws (included) at the top of the ground sleeve to help prevent vibration and theft. You may also put a small pad-lock (not provided) through the bottom section of the last button to help deter theft.